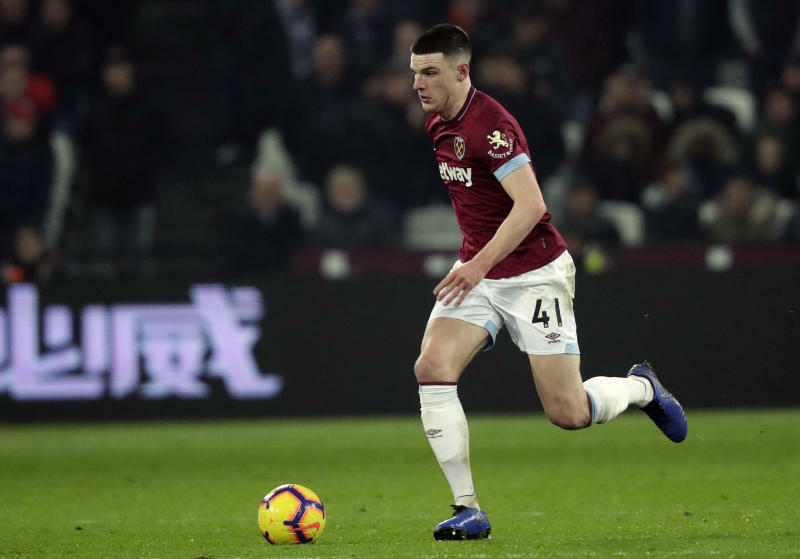 LONDON (AP) — Preparing for a possible England debut after switching international soccer allegiance from Ireland, Declan Rice apologized Thursday for past online expressions of support for the IRA. The Twitter posts referencing "Up the RA" — short form for the Irish Republican Army — resurfaced in Irish media before being deleted by the 20-year-old Rice. Rice played for an Irish national youth team at the time of his IRA-laced posts in 2015, in one case responding to a teammate by adding: "Wait til we draw England." The West Ham player was granted approval by FIFA earlier this month to change his international affiliation to England, his country of birth, after playing three friendly games for Ireland. Responding to the escalating furor, the West Ham player accepted his comments were "poorly expressed" while distancing himself from the IRA. "I recognize now that my attempt to show support for my team-mates at the time could be negatively interpreted," Rice said on Instagram. "While my naive words were not meant to be a political opinion and do not represent who I am, I sincerely apologize for any offence caused." The IRA's main faction, the Provisional IRA, killed nearly 1,800 people during a failed 1970-1997 campaign to force Northern Ireland out of the United Kingdom. Most militants have renounced violence, but some IRA dissidents carry out occasional bombings and shootings. The English Football Association said it would be writing to Rice "to remind him of his responsibilities." England coach Gareth Southgate has not said if Rice will make his debut on Friday. Rice's "Up the RA" tweets emerged just before Southgate faced the media at Wembley Stadium where England opens its European Championship qualifying campaign against the Czech Republic on Friday. "This was when he was 15 or 16 when he was engaged in a social conversation with friends," said Southgate, who hadn't spoken to Rice about the posts. "I think any of us at that age, in those sorts of situations have probably said things, discussed things, written things, that might not look the way that'd we'd want (them to) several years later. "So I don't think he can say or do any more than he's said at this point in time." The specter of the IRA has been ever-present at England games for years, with fans chanting "No surrender to the IRA" at stadiums both home and abroad. The FA has struggled to stop fans inserting "No surrender" between lyrics of the national anthem when "God Save the Queen" is played before England matches.